We saw someone else on youtube do something, and this is our simplified attempt. It didn’t cost much or take long. About $5 of matches and an hour or so to set up and burn. For the base to hold the matches we used a very basic plain flour and water dough, so it would be non toxic if it caught on fire. I tested first by trying to light some with a butane torch, and it blackened, but didn’t catch alight. Perfect. 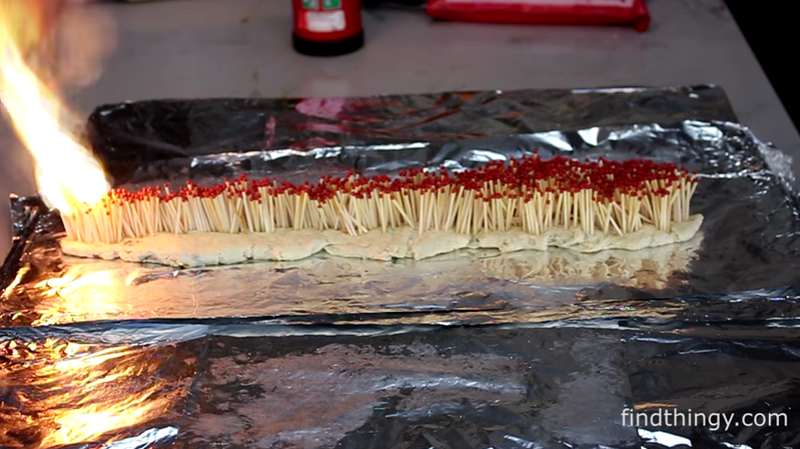 I was a little surprised by what other youtubers used – It looks like some of the youtube videos with burning matches used hot melt glue. I’m not too sure I’d want to be breathing anywhere nearby when that burns.